Dellasposa is honoured to host a selection of international artists who, in their own aesthetic expression, dare greatly and lead boldly the new generation of women artists in the 21st Century. The artists featured in the exhibition explore ideas of femininity and feminism. Investigating the role of women from the perspective of the past, present, and future, the artist's multi-disciplinary works draw inspiration from contemporary visual culture with a rich and layered tapestry of cultural references from history and different locations. While gender is not the only theme found in their work, there is a common thread of women’s personal freedom of expression that weaves together the narrative of the exhibition. Through the vision of the artist's work, we can see that the future is female. International artist Alicia Paz's artwork explores female identity, focusing on the female figure. By creating large scale paintings, Paz demonstrates the way identity is experienced and presented as multiple, paradoxical and subject to constant change. Paz’s paintings draw on the Portuguese Azulejos tradition by way of technical trompe l’oeil rendering. 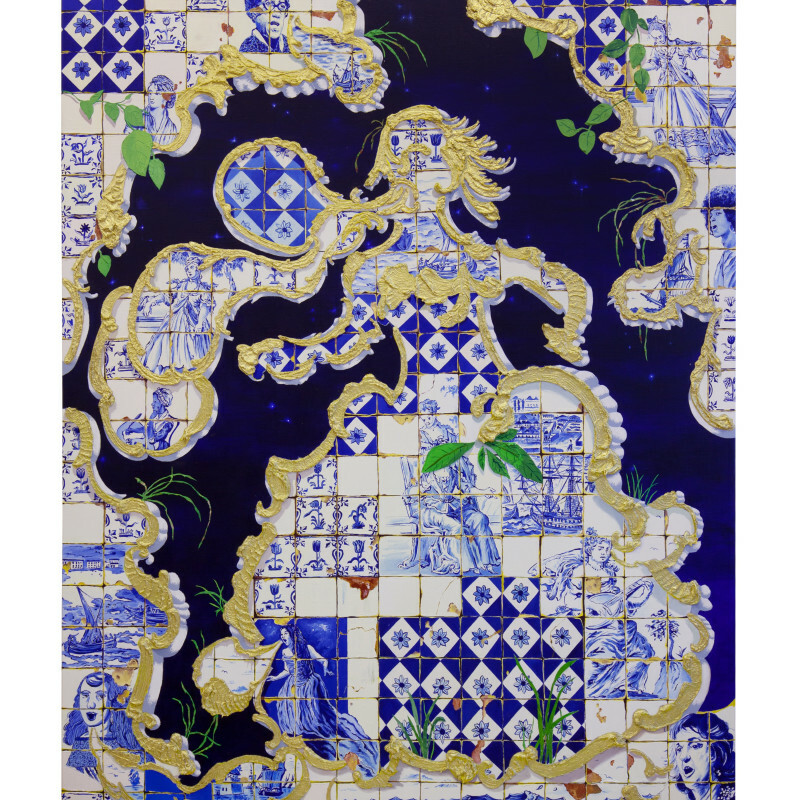 The patterns of the Azulejos and their conflation with the female figures emphasises the universality of the female cultural experience; that women carry their traditions and aesthetic influences within themselves, wherever they go. Tahnee Lonsdale’s paintings represent the newest direction in semi-abstract painting. Amorphous figures, architecture, and other objects populate vibrant fields of colour that suggest anything from domestic interiors to wild landscapes. Lonsdale’s paintings are true works of existentialism, dealing with universally relevant topics such as faith, feelings of loneliness, emotional instability and the female condition. She draws on her personal experience as a woman and a mother to create such poignant works, and is largely influenced by feminist theories and gender studies. Gail Olding’s sculptures are layered with critiques masked as visual puns. She adopts a level of poeticism to demonstrate her socio-political position. Olding’s multi-disciplinary work exemplifies personal experiences with universal relatability, applying the individual to the many. The anthropomorphic shapes Olding creates are highly suggestive of women’s figures. Her sculptures are in equal parts cerebral and physical; compelling explorations of linguistics with a strong physical, female presence. Ehrynn Torrell is a Canadian artist who juxtaposes her modern feminism and her portfolio by creating artworks akin to protofeminist, traditionally female mediums. In her latest series, her textile paintings aim to explore the act of making and looking at images today, with the seemingly endless contextual variations that online search engines, filters and hashtags provide. This new work in textiles is an extension of her established painting practice, and features the densely layered and explicitly visual compositions that are characteristic of Torrell’s work. Torrell's textile paintings are each based on an individual collage work that has been scanned, enlarged and printed onto linen, where the linen surfaces are manipulated further through cutting, layering, embroidery and quilting techniques. With shards of imagery torn from the pages of British Vogue magazine, she has assembled into a composition using an improvised technique, where fragmented images of female bodies, textiles and luxury goods and connected in a series of formal relationships. Vogue is one publication among many that has shaped ideals of female representation, carrying with it a long history of homogenous portrayals of race, gender, class and sexuality. Torrell is interested in the history of representation in women’s fashion magazines; the nature of constructed and deconstructed imagery in our media, and collage as a social-political practice that engages the matter of everyday life. We understand the value of women’s role in the world and we appreciate the value of women’s art in our cultural history. Dellasposa is proud to support and encourage women artists, who for too long have been painted out of (art)history. We can see, through the dynamics of the art market and the public institutions and museums, that there a clear inequality and gender disparity between male and female artists. Art by women has been under-appreciated, under-represented, and undervalued for centuries. Now, time is up. With this exhibition, we hope to shift awareness to the forces at play, and honour the achievement of these women’s art(work).